Maybe getting settled is getting ahead of myself, but I’m slowly getting over the shock of living in Chile. I still haven’t wandered very far from my hotel, but I’m seeing new things every day. Yesterday I received a blackberry and laptop from my work and spent the rest of the day trying to figure them out. I spent a few hours in our local office and was even taken out to lunch by a few of our employees there. After work I wandered around for a few hours and eventually settled on what was to be a very expensive restaurant. I started with a salad that I thought would contain artichoke but instead contained asparagus and some other vegetable. The menu was even in English, so that was all my fault. It turned out to be delicious though, the first time I’ve been able to stomach asparagus. Main course was some sort of lamb chops, but the waiter explained that I was supposed eat it with my fingers like spare ribs. Or at least, thats I what I think he was motioning with his hands. It was a great meal, but I need to find cheaper places to eat. 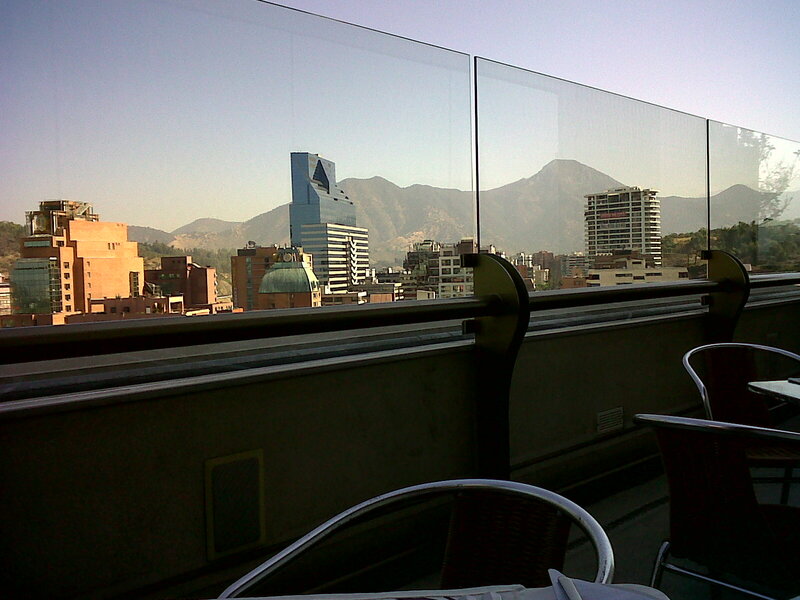 This morning I had breakfast on the roof (17th floor) of my hotel, it was an amazing view! You can’t see much from the street level here, there are too many tall buildings in the way. It was a surprise to see mountains and further than just a down the street. Also, food was great. I spent the afternoon walking around for a few hours and then sitting and reading outside for a bit. All the meals are eaten much later than in the US here. I couldn’t take it and finally sat down for lunch at a cafe at 1:30. It was just starting to fill up when I left at 2. Next adventure was the grocery store. Pretty much the same in the US with just a few differences. The cashier talked to me as if I was fluent in Spanish, then ignored me once I sputtered out “no hablo espanol”. I really wish I had learnt at least a little Spanish before moving here; people seem to be really upset that I first didn’t speak fluent Spanish before setting out. Lo Siento, Chile! This entry was posted on January 30, 2010 at 9:02 pm and is filed under Uncategorized. You can follow any responses to this entry through the RSS 2.0 feed. You can leave a response, or trackback from your own site. Thanks for pointing out the blog. Try to remember that they use commas where we use periods and vv when notating money! That always confused me. Let me know when you are scheduled to head for the OSF. That will be the real beginning. What you are doing now is learning how to live in a different culture with different language and customs but at least you stay in a hotel & sleep in a room big enough to move around in. The 1st shift at the OSF will bring a whole new dimension to your world. Roll with it and remember that there are still a bunch of really nice people there. They have always been very tolerant, helpful & supportive of me. I’m sure you’ll have some fun. I bet you’re glad to see a bit of sun after the freezing Detroit. ” donde estan los servicios? All I know of Thai is. HONG nam (water room) and Mai pen rai(never mind. Sounds like your hotel might be close to downtown (17 story hotel). If you are, you might want to walk (or taxi) to the main plaza in the center and soak in some of the history. Also, not far away is a park (Santa Lucia) with with funiculars/cable cars and much to explore. We enjoy your blog and hope all goes well down there. Ah, yes, put in a good word to the outer space fellows from us also, if/when you hear from them. Best of luck!.